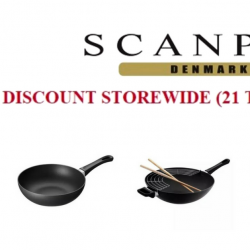 Till 29 May 2018 Scanpan: Enjoy Up to 70% OFF Storewide + Additional $12 OFF Pots, Pans, Knives & More! Made in Denmark, SCANPAN is one of the world’s leading manufacturers of cookware with its roots deep anchored in traditional craftsmanship. Upgrade your cooking with their high quality cookware at up to 70% off storewide at Lazada! Also use the coupon code for additional $12 off when you spend minimum $120! Coupon code is valid till 17 June 2018 but sale ends 29 June 2018. 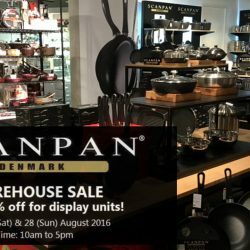 One of the world's leading manufacturers of cookware from Denmark, SCANPAN is having a warehouse sale this weekend! Enjoy up to 80% off cookware display units at the sale on 27th and 28th August 2016. Bring a friend and purchase a cookware each to receive a gift each!